I made this over a year ago and have been using it fairly consistently - last couple of days I decided to put some final polish on it and send it out into the world. Clock, alarm, stopwatch and countdown timer - and, should your system allow, an uptime indicator as well (doesn't work on all systems for reasons unknown). tiggz/ you/ are/ a/ master/ you/ should/ be/ getting/ paid. I've been revisiting all of your skins. They are absolutely timeless. The stuff you were doing 5-6 years ago is just amazing. Love your stuff. Don't ever quit doing what you do. Very convenient Tiggz but could you make the time display sharper? Looks dim and fuzzy to my old, tired eyes. Too cool for school, thx for the shiny new toy. 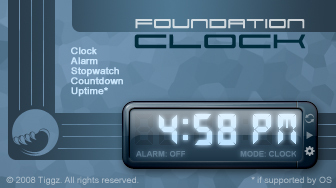 Looks great, one question where should I put the file foundationclock configuration settings?